After three masterful displays so far in the third AFLW season, most pundits have all but handed the trophy to North Melbourne. Before the season HPN used Player Approximate Value (PAV) to estimate that they likely had the strongest team in the competition, and by a fair way. This prediction seems to have come to fruition so far. However, before HPN hops back on that ever-growing bandwagon, it is worth looking at how North got to this point, and how far in front of the competition they have been so far. NOTE: these ratings have been adjusted for the opposition each side has faced. Right now, the AFLW is a competition in two parts – the elite four and the other six. The Western Bulldogs would rightly have issues with this assessment, and they may work their way up into the former group by the time the season finishes. The Dogs were hurt by their big loss to North last week – and luckily the draw will ease for them from here, and North will presumably go on to beat up more of their rivals. Carlton and Melbourne were the big gainers last week. Melbourne exposed real flaws in the Lions, and Carlton did the same to GWS. 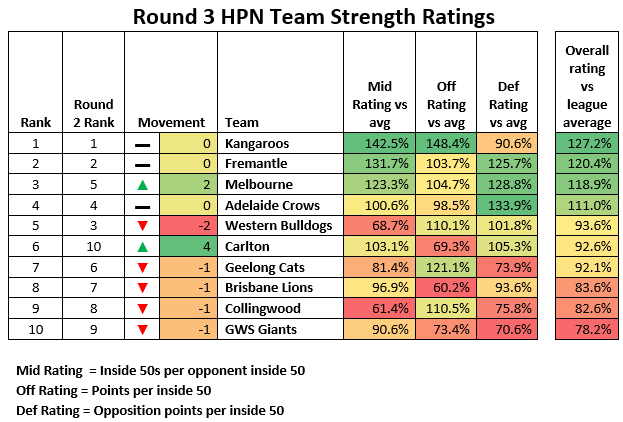 HPN had Brisbane and GWS as the clear favourites for Conference B this year, but both appear to be well off the pace that their projections suggested even after accounting for team changes. HPN has touched on this in the past, but North’s recruiting access is virtually unprecedented for an expansion side in a league with a list management structure like this. This just isn’t with respect to Australian professional/semi-professional top level sport – from our research this extends across the board for draft/cap systems. Usually when allowing new sides into closed, salary capped, draft-controlled competitions, a balance has to be struck between allowing the side to be minimally competitive immediately, without actively hurting the ability of the existing sides to compete and win. Most expansion efforts usually place protections or limits on how many players can be poached from each side, and how good those poached players can be. For example, when the Vegas Golden Knights were granted entry into the NHL, existing teams were able to protect between 9 and 11 players from selection by the new side. The Golden Knights were then able to draft one player per side, and embark upon trades to improve their roster from there. The Golden Knights were ultimately incredibly successful in their first season, but most of that was down to shrewd trading and the maximisation of perceived marginal talents in an impressive tactical system. Going into this season, there were plenty of people who had trouble seeing the Knights even reaching that modest level of success. Most outlets picked Vegas to finish either last or next-to-last in the Pacific Division. Melbourne Storm’s first year in 1998 saw them make a preliminary final. Rugby league lacks a draft and a trade period, and the club formed in the midst of rugby league contracting after the Super League war. They signed most of its key players from folding Super League clubs. Protecting existing clubs from poaching just wasn’t an issue when there were multiple teams like the Adelaide Rams and Western Reds disappearing completely. The Western Sydney Wanderers entered the A-League, a league with a salary cap but with soccer’s typical anarchic free agency arrangements as well as its international nature. They managed to finish minor premiers and lose the grand final in their first year. Nine of their 30 man squad came from non-defunct A-League clubs, with no more than three from any one rival. The rest came from outside the A-League. Within the salary capped and draft-controlled AFL, Port Adelaide surprised by only missing finals by percentage in 1997, and no other modern expansion team went close to finals. Port Adelaide recruited most of their list from the second tier SANFL, traded the rights to other players for a few more players, and most notably had the ability to “trade” pre-round 1 picks for five established players including Gavin Wanganeen, Scott Cummings, Matthew Primus, Adam Heuskes, and Ian Downsborough. In this respect, North Melbourne’s AFLW expansion path has been a very different beast. From the time their recruitment of established players was first made, they have been near or at the top of the list of pundit favouritism, with a deep battery of top end talent, and the major query being a vague concern or hope that they wouldn’t quite “gel” enough. If this tier structure were effective, North shouldn’t have been able to build up an unbeatable cache of talent. Theoretically, the talent should be relatively evenly distributed across the competition, with players finding payment tiers in line with their talent. Outside of this $474,800 cap is an additional uncapped amount per club that can be used to pay players for promotional work – with strict guidelines. The ASA cap has no limits per club, and theoretically a smart club could top up the tier 2 and 3 slots to create additional marquee level salaries. There is no official indication that North has done this. More important is how the Roos have focused on recruiting from groups of kinship – their linked VFLW side (Melbourne Uni Mugars) and practically the entire Collingwood 2018 AFLW forward line. Kearney, Gillespie-Jones, amongst others, came via the Mugars, while names such as Duffin, King, and Hope came via the Collingwood pathway – the latter two former Pies tier 1 players, and the latter the reigning VFLW player of the year. Four Brisbane players, including two Queenslanders, were also recruited. The most senior one of these four – Kaitlyn Ashmore – was originally recruited from the Mugars. They’re not all moving for higher tiered pay. As the salary differences between the tiers is relatively small, and even at the top pay is not exactly enough to constitute full-time full-year work, some form of salary bridging plus the lure of playing with friends is likely enough to entice this level of talent to congregate. In leagues with larger salary caps, and where competing is a full time, year round profession, these two non-market mechanisms wouldn’t be nearly as effective in drawing talent to congregate in one spot. It is also worth briefly mentioning Geelong here. Geelong took a somewhat similar kinship based approach to building a list, but with a geographical and much more youth oriented bent. The Cats largely mined talent from the local regions, and were granted an exclusive draft zone outside of the rest of Victoria for players who wanted to commit to them. This bond-building will likely pay dividends in the long term as salaries continue to rise and extra sides are introduced into the competition. However, the Cats’ VFLW set-up is quite fresh compared with the long standing Mugars institution. It must be stated that AFL HQ potentially saw these issues occurring before they actually happened. Instead of an essentially free market free-for-all, the AFL proposed a points cap based system be used to gift the new two clubs with talent to make them competitive immediately. Points based systems aren’t necessarily new or novel, and are used across various levels of professional and semi-professional sport in Australia to ensure competitive balance. Country football uses a similar system, as does the WAFL, the Australian Baseball League, various basketball leagues (here’s the old QBL one), and other sports. At face level, the AFL proposal was among the simplest of these systems, and not without flaws. However, after pushback from existing clubs, the proposal was scrapped. Even with the flaws in the original proposal, it is highly unlikely that North Melbourne would have been able to amass as much talent as they have this year. In a sense, the original eight clubs were partially at fault for their own apparently impending, Shinboner-inflicted demise.